C.F. 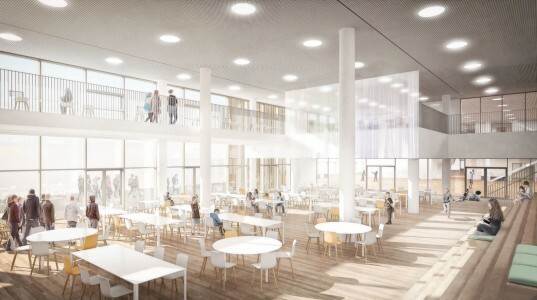 Møller Architects just unveiled plans for the Copenhagen International School (CIS), a massive solar-powered building that will be Copenhagen’s largest school when it's complete. 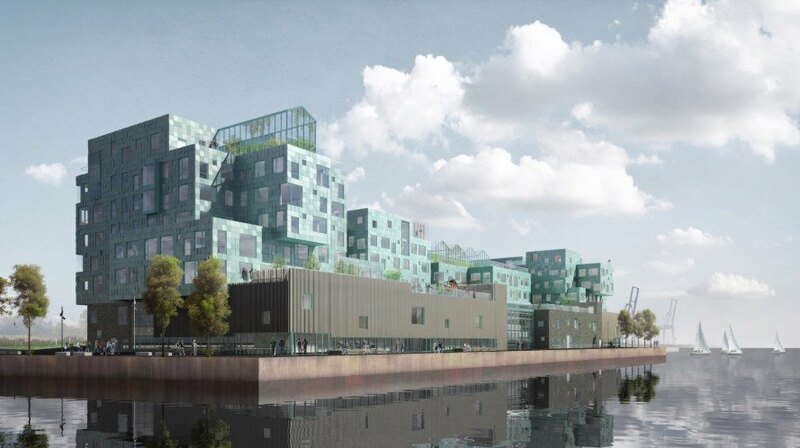 The 25,000-square-meter school will be built in the city’s Nordhavn district, and it will accommodate 1,200 students and 280 employees. CIS Nordhavn’s roof will be topped with 12,000 angled solar panels that will supply over half of the school’s annual electricity needs. Located on the water’s edge, CIS Nordhavn is sandwiched between the public waterfront and Copenhagen’s urban fabric. A promenade outside the school provides public access to the waterfront. To mitigate the project’s large size and formidable programming requirements, C.F. Møller Architects divided the main building into four smaller and interconnected towers. Each tower, which ranges from five to seven stories, boasts different designs and layouts that best accommodate different grades and student age groups. The four school units are set atop a two-story ground-floor base that houses common-use facilities such as the gymnasiums, cafeteria, library, and performance spaces. Since these facilities are separate from the classrooms, the students or local community can still make use of those spaces outside of normal school hours. A school playground is located on top of the base structure’s roof. Over half of CIS Nordhavn’s electricity will be supplied by a 6,048-square-meter solar array that is estimated to produce over 200 MWh per year. The school will also incorporate the solar cells into a permanent part of the school’s curriculum. Students will be able to monitor energy production and use the data in their physics and math classes. The school is now under construction with an expected completion date of 2017. To mitigate the project’s large size and formidable programming requirements, C.F. Møller Architects divided the main building into four smaller and interconnected towers. Located on the water’s edge, CIS Nordhavn is sandwiched between the public waterfront and Copenhagen’s urban fabric. Each tower, which ranges from five to seven stories, boasts different designs and layouts that best accommodate different grades and student age groups. The four school units are set atop a two-story ground-floor base that houses common-use facilities such as the gymnasiums, cafeteria, library, and performance spaces. Since these facilities are separate from the classrooms, the students or local community can still make use of those spaces outside of normal school hours. Over half of CIS Nordhavn’s electricity will be supplied by a 6,048-square-meter solar array that is estimated to produce over 200 MWh per year. The school will also incorporate the solar cells into a permanent part of the school’s curriculum. Students will be able to monitor energy production and use the data in their physics and math classes. The school is now under construction with an expected completion date of 2017.